Wills only control probate property, which is property that does not pass to a beneficiary by some other means. Probate property often goes through a court-administered probate process before being distributed. Common methods by which property can pass outside probate include beneficiary designations and rights of survivorship. For example, a beneficiary named on a life insurance policy inherits that money when the insured person dies — no matter what the will says. 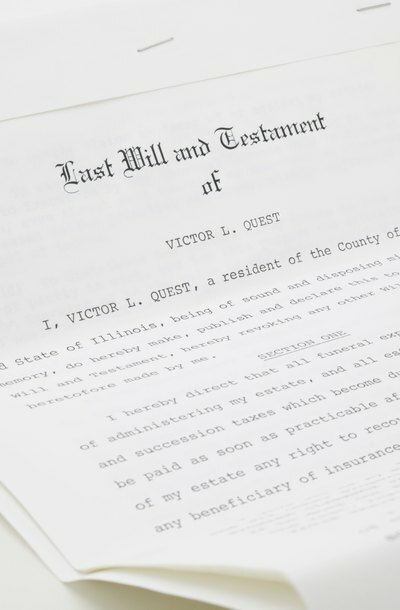 Such assets that pass outside probate are considered non-probate assets; they are not controlled by the will even when the will attempts to give them away. For example, if a will attempts to give away an IRA or 401(k) that already has a beneficiary designation, the person named in the beneficiary designation still inherits the account. Like other jointly-owned property, joint accounts often come with rights of survivorship. Typically, these rights are found in the documents that establish the account. However, state laws may create a presumption that a right of survivorship exists between joint account holders since the law assumes that people who want a joint account during life also want each other to have the entire account when one dies. Rights of survivorship make joint accounts non-probate assets since they create a way for the funds in the account to pass to another person without probate. Funds in accounts with rights of survivorship generally pass automatically to the other joint account holder, so these funds do not fall under the will’s authority. Since the will can only control probate assets, the funds in the account cannot be distributed according to what the will says. This does not mean the joint account “overrides” the will. Rather, the fact that the account is held with rights of survivorship means the money simply transfers without having to go through probate. If, in his will, the account holder attempted to give his share of the joint account to someone else, that gift is simply invalid. Depending on state laws, there may be exceptions to this general rule. Though states presume that joint account holders want to share rights of survivorship, that presumption can often be rebutted by showing that someone’s name was added to the account merely for convenience. For example, if an elderly mother adds her daughter to an account so her daughter can take care of paying the bills for the mother, a court could decide that the mother did not actually intend to create a joint account. Thus, the money in that “joint” account would pass under the terms of the mother’s will. In Pennsylvania, courts have held that a will created before a joint account overrides any terms on the account that establish a right of survivorship.